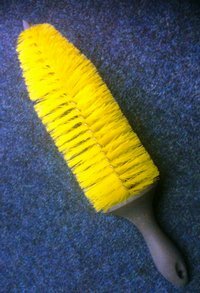 A big and wide soft nylon wheel cleaning brush with tough rubberised handle and splatter guard, with hanging eyelet. The end features a soft rubber bung to prevent scratching, though brushes should be used in a way that doesnt force the metal core against the wheel surface. Measures 9cm across, 38cm total length of which 23cm is actual bristles.